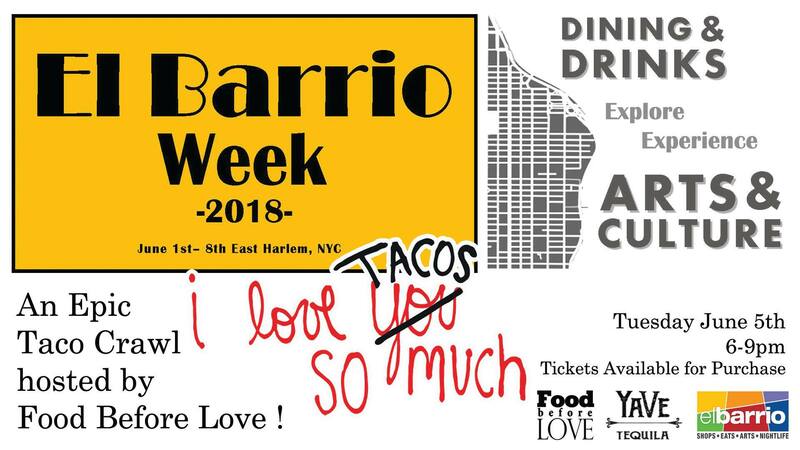 El Barrio Week 2018 kicks-off on June 1st with a plethora of events that highlight the richness of East Harlem. One of the many events during the week will be an Epic Taco Crawl, hosted by Food Before Love on Tuesday, June 5th. The Crawl will begin at 6:30pm,(check-in begins at 6:00pm) meeting at Hope Community, 174 East 104th Street. Secure your wristband and from there you can Crawl en mass or Crawl on your own. Next Next post: June 16th ~ A Night of Jazz & Swing!